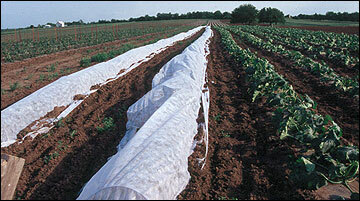 Floating row cover is a generic term for very lightweight, translucent material (usually spun polypropylene) that is placed directly over tomato cages and rows of food crops and ornamental plants to give frost protection, protect plants from insects, and protect them from various other unfavorable conditions. Floating row cover is so named because it doesn't have to be supported with hoops or other devices. It can just be set right on top of the growing crops, where it will "float" above them. Covering plants with this material will give them 4-5 degrees of cold protection. Since the row cover transmits light, it can be used for crop protection over an extended period without being removed. Some of the various brand names include: N-Sulate, Harvest Guard, Frost Shield, Frost Blanket, Reemay, Agronet, Grow-Web, Plant Guard, Plant Shield and others.